My family and I are taking a vacation in Hawaii and we arranged to make a day trip to the island of Hawaii (we’re staying on Oahu) so we could visit Volcano National Park and see some other sites. One of the places we visited was the black sand beach at Punalu`u`. We arrived late in the afternoon so the lighting was nice, but still very bright. The combination of black sand, volcanic rock and bright sky made for difficult exposures. Fortunately things weren’t too bad when I was able to shoot away from the sun. 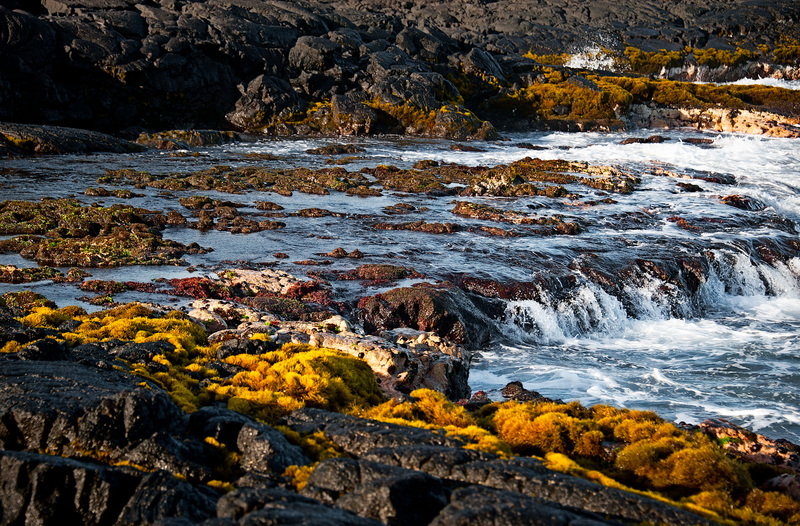 Punalu`u is a fantastic location and trying to shoot it made me appreciate the challenges of creating a great landscape image. Trying to come up with the right combination of exposure, proper f-stop, etc. is something I’ve never really been good at. With this shot I tried to capture the look of the area with it’s dark rock, interesting vegetation and wonderful surf. Processing was actually pretty minimal. I added some blacks back to the raw image to improve the contrast and did a little sharpening. I also added a brightening curves layer which I selectively applied at various opacities with a brush to bring out some of the highlights. I would certainly love to hear any constructive feedback on what you think of this image, and things I might have done to make it better. Please feel free to leave comments or questions below. Mahalo! Copyright ©2011 James W. Howe – All rights reserved. Hmm… Well. I like the image by itself as it just tells me what the place is like. Now, if I was going for something more artsy I guess I would look at first on what I could leave out of the picture. The foreground comes to mind. It looks like the little tiny fall goes off a bit more to the left. Without knowing what other possibly unwanted elements were there, I would say get closer, lower and more to the right. Essentially focusing on that small fall. Maybe even slow down the shutter a bit for some nice blur. After that cropped down maybe into a pano style shot. I think the images stands just fine on its own. I would have used a filter (ND or Polarizer) to slow the shutter speed and blur the water. Personally, I love the grand scale of nature, would have used a wide angle tog et some background and sky. But, the image is just fine as it is. Nice work buddy and Happy New Year! I had my polarizer with me and I should have put it on, but I didn’t think about it. It was very, very windy at this location and I might not have been able to get a reasonable shot without blurring, but I probably should have at least tried since it will probably be some time before I’m able to get back to this location. Thanks for the feedback! A beautiful image. All the best for 2012!! !